Dress, Heels, and Toes! | Helmet or Heels: I'm comfortable in either! ← Maiden Voyage to Work … and Home! 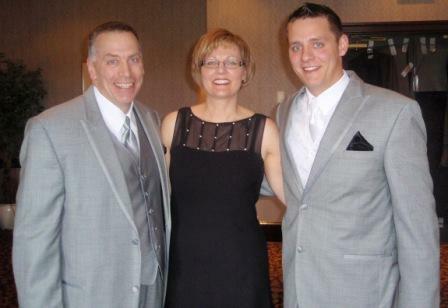 Last weekend was my son’s wedding! Remember my post about shopping for a dress? I did find one and it wasn’t as hard as I thought it would be! Here I am with a couple of my favorite guys! Enough about me, shopping and my dress! I want to share a little about my new daughter-in-law. I’ve always said if you want to see what kind of man a guy is meet his wife (if he’s married). How a husband and wife treat each other reveals a lot! Does she respect him? Does he treat her kindly? Are they better together than they would be separately? Looking for answers to these types of questions will reveal a lot about both of them. When my son and then girlfriend started dating it was immediately evident that she made him a better man by how she talked to him and treated him. As a mom, that is all I needed to see; my son was in good hands. I’m looking forward to getting to know my daughter-in-law even more, but one thing I do know is that she loves heels! How great is that?? I don’t have a picture of the shoes that she wore at the wedding (a sweet pair of hot pink heels), but here is a picture of the heels she had on a couple of days later! And check out the toes too, especially painted for the wedding. Check out the "I Do" toes! This entry was posted in Clothing, Heels, Shopping and tagged heels, shopping. Bookmark the permalink. LOVE those heels! and those toes 🙂 very cute and nice picture of you, your husband and son. love the shoes! where can i find them? Where can I find these shoes? That are adorable! Who made these shoes???? Where can they be found!!? ?